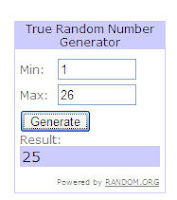 Thank you so much for you entries into our previous challenge (8) Clear as Day, there were so many beautiful entries using a huge variety of techniques and it was an absolute pleasure visiting you all. Judie, Julie and myself have chosen our Top 3 this week (one each!) 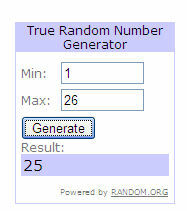 and we'll be back with that and the winner of the fabulous Tracey Coates stamp plate later on! Did any of you catch Jill & Tracey on C&C this saturday, I know Lilac anglia did as I heard her email read out! 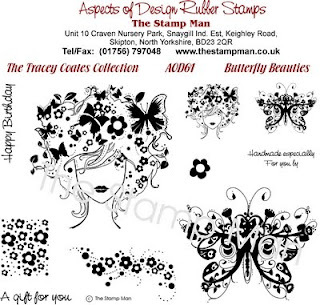 If you like Tracey's stamps pop over to her blog as she's looking for suggestions on new designs! Number 25 - Crafty Kitten! Well done sweets, please email me! Our Top 3 this challenge was a joint effort between Judie, Julie and myself and we chose one each so here are our choices! Grab yourself a well earned blinkie from the sidebar! Onto Challenge 9 which is sponsored once again by Joanna Sheen. Joanna was also on C&C over the weekend, her shows are so inspirational too and lovely products. New in her shop this month are the Promarker gift sets whoop whoop! These are specially selected packs of 12 promarkers in various themes, also containing blender pens, a wallet, fineliner and bleed proof marker pad, fantastic! There are also some extra extra cute house mouse decoupage sheets new in stock, go take a peep as these are gorgeous! 2. Alternative route is to use a NON CHRISTMAS IMAGE using TRADITIONAL COLOURS so maybe look at your sumer tildas and do them in traditional red/green/gold. I know this works very well for the shopping Anyas. Papers from pink petticoat tis the season, purple mirror card, black mirror card sprayed with crafters companion gold spray & sparkle, mediallion peel off layered on to mirror card and cut out, peel offs from stash. I used a square white card and then stuck 3 oblongs of pale mauve paper at the top, left hand side & the bottom.I then used part of a blue card kit which I have bought from craftsuprint, printed and cut out a second black snowflake which I stuck on top of the original one using foam pads, the box with the sentiment is part of the kit and I added the words from my stash. I also added some glitter silver snowflakes to give it some more depth & interest. I have chosen to do the christmas card with the non traditional colours - I am out of favour at the mo with images and colouring, so I have chosen to stamp & emboss a border stamp that I have - I mixed the emboss powder with glimmer powder so that it gives it a different kind of shimmer. I have used my ruler that I rip and distress paper with to make the edges on my card a bit different, I lined it up and used a blue metallic pen to make the edges untidy. A good way to make your christmas cards without knowing. 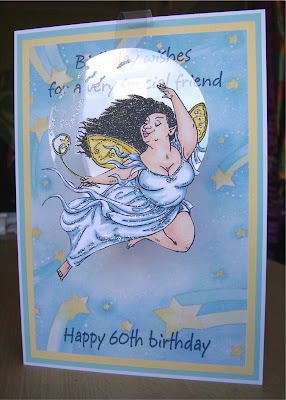 The image is a digi-stamp from Pink Cat Studio, coloured with promarkers and with lots of glamour dust. The papers are My Mind's Eye, with some sparkly blue cardstock from my stash. Computer generated sentiment. The snowflake was cut with the cuttlebug icicle die and then coated with glamour dust. Added some large pearls to the snowflake centres on the image and on the cuttlebug snowflake. Base of card is an A4 sheet folded in half. 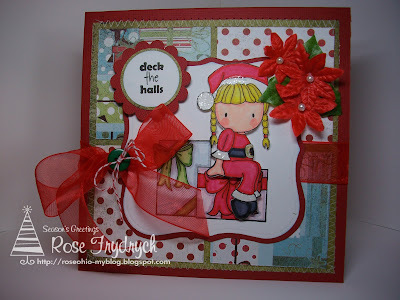 The patterned paper is from the DCWV Rose Tinted Christmas stack. Stamped image is Penny Black coloured in with Promarkers, fur trims are Woodware fluffy stuff covered with glitter and heat embossed so it puffs up. 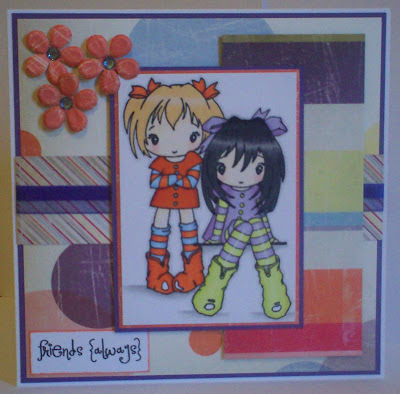 Image has been cut out using a Nestabilities die and matted onto metallic card. The whole image is mounted onto 3d foam. 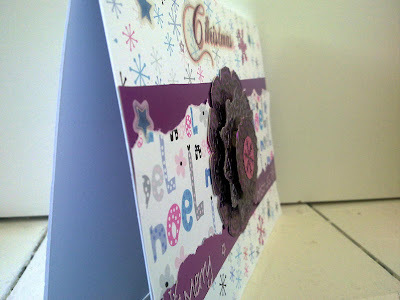 A second strip of card was punched using the Fiskars scallop edge border punch and the bobble trim is from Doodlebug. Added embellishments are Craftime glittered snowflakes and pink gems from Paperchase. Copic Markers - E57 Light Walnut, E47 Dark Brown, E37 Sepia, E00 Skin White, E21 Baby Skin Pink, Y11 Pale Yellow, Y08 Acid Yellow, Y17 Golden Yellow, R20 Blush, B22 Phihalo Blue, B93 Light Crockery Blue, B45 Smokey Blue. I stamped Edwin onto White card as well a piece of eclipse tape to use a a mask on the white card. I then stamped a series of trees as a background. I used the same method as for Edwin and created mask of the trees as well. I create a sky using pastels that I sealed with Hair Spray. I removed the masks from the trees and added snow to the sky and trees using Stickles. i also added green to the Branches. Once dry I removed the mask from Edwin and coloured him in using Copic markers. I added highlights using clear stardust pen. I rounded the corners of the white card and edge using a blue Copic pen. I mounted it on to a piece of pink card also with rounded corners. 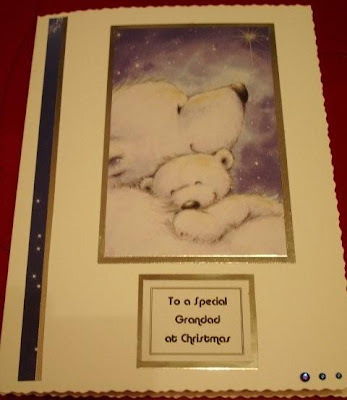 Which was then mounted on to a card created using a sheet of A4 blue card folded in half. Added some snowflakes and a bow. I rounded the corners of the card and also edge using the same blue card. I cannot begin to tell you how special this stamp is! I've written a whole lot about it over on my blog . It is a custom made stamp of my great grandmother, aunt Geraldine, my father and my grandmother (Nan!) that has been stamped onto starburst stains in cathedral pines green, peony scarlet red and winter jasmine gold using them as sprays by changing the dauber caps. 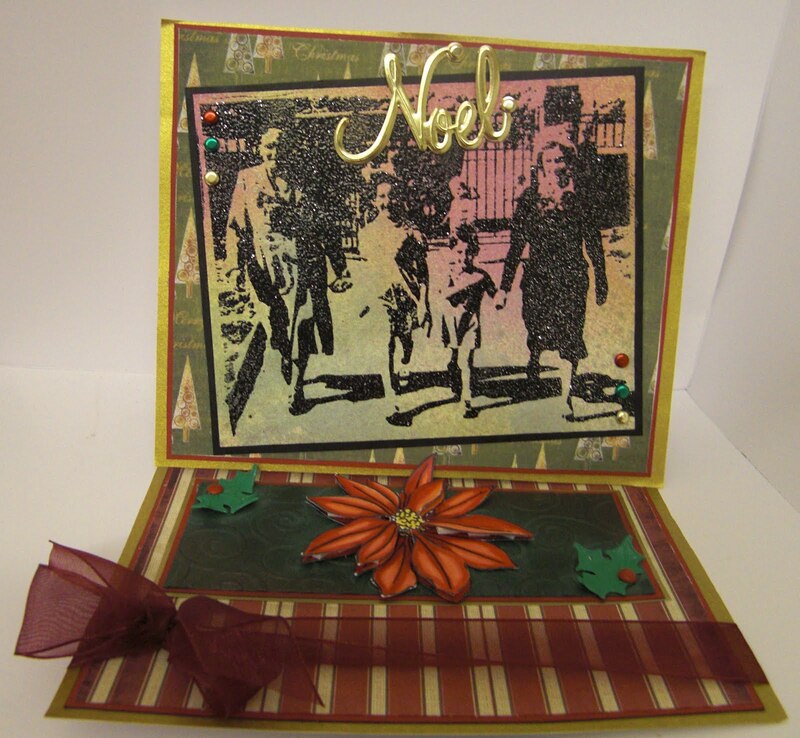 I embossed with black sparkle powder making an easel card. The papers are printouts from Bearly mine designer extreme vol III and the poinsettia is from a simple expressions plate coloured with promarkers which I've made 3d. BTW if you want to win this plate Cath has it up for grabs but be quick as it closes today! I've added an embossed panel on the base and used metallic rub ons in the corners and added 2 holly brads, I think they're HOTP as Ive had them ages. I curled them up with a pair of pliers to act as the stopper. You may have heard the term "Masking" but aren't quite sure what it is or you may have seen images put together with no overlap of lines and wondered how its done so we'll show you how! This technique is called Masking as it hides (or masks) another image you can overstamp. You will need your stamps and some post it notes. A piece of paper is fine but post it notes are tacky on the back allowing you to stamp without the mask moving giving you both hands to work with. You need to decide on your image layout, what is going to be the furthest away object and which is the nearest? Start with your nearest object, in this it is the lady in the lake. Stamp into your blank card and then stamp again onto your post it note and cut the image out as close to the lines as you can get it. Try and make sure part of your image is stamped where the tacky bit is on the back as this will hold it in place. Place your cut out mask over your stamped image as below. This will allow you to stamp objects further away without leaving lines over your original image. Stamp your next furthest image where you would like it as the picture below shows. Continue with masking your next layer if you wish to add more images as I have done with the mountain in the background. The finished item. You may notice a slight gap around the lady, I didn't cut close enough which will leave a gap like that so its important to cut as close to the lines as you can. Wow sooooo many entries for Challenge 7 Stamp Something THANK YOU and I'm so glad lots of you took the extra challenge and gave your heat guns a run out or did something a bit different! Thank You again to Joanna Sheen for sponsoring us and also to Beth for being our special guest. I must apologise for not doing a tutorial as planned this week as I've been poorly ick ick so I will catch up with more stamping tricks and techniques as soon as I can! Its taken a long time to get round to this because there were many duplicate entries. Just a quick reminder that we have a maximum of 3 entries per challenge rule as not everybody is a super fast crafter so it makes it fair all round. 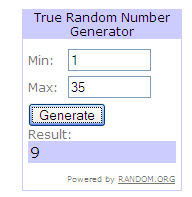 If you entered more than 3 cards in challenge 7 then anything after your 3rd entry is not counted, sorry. 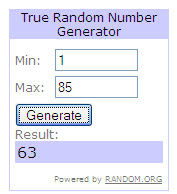 I've had to check, recheck and check again to make sure the numbers are correct and I make it 85 valid entries so here goes! Well Done ladies and please grab yourself your blinkie in the side bar! Also a very special mention to Scott, Ruby, Sophie & Rachel our younger crafters who've taken part in recent challenges. Its lovely to see young crafters and we hope to see more of you! Okies onto Challenge 8 - Clear as Day. What we'd like you to do is include some thing clear, transparent or translucent, something see through. Try making some fairy or butterfly wings from fantasy film or similar. There are lots of possibilities on this one so we can't wait to see what you come up with! And the prize??? Ooooh I have a special treat for you! 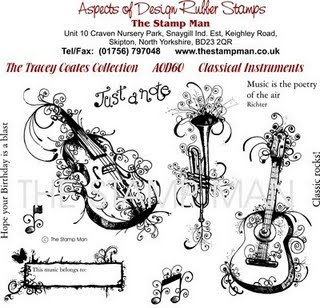 Some of you may know that I have been asked to join the Design Team over at The Stampman who sell some of the most amazing stamps and products, please go and check them out as its like Aladdins Cave! 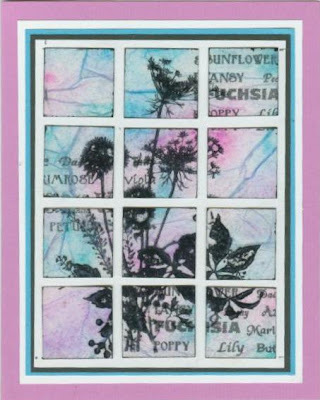 One of their newer additions are a range of stamps by the talented Tracey Coates and the prize we're offering is to choose one of her 3 new plates. You can choose either Butterfly Beauties, Starburst Fairies or Classical Instruments it will be your choice! I love them all personally so I couldn't select one to put here so thought you might like the choice yourself! Also watch out for them on Create & Craft TV on 28th November! As an extra treat I am also offering some Moonglow blog candy over at my Blog, pop on over to enter! Lets have a loosie at what the Design Team have created for you this challenge! We've all had a lot of fun with this one and hope you do too! Please leave your entries in the comments box below Cath's card by 12 Noon GMT Monday 30th November, good luck! 8" card blank, 3 shades of purple card for matt & layering, nestabilities for the circles, rub on sticker, double sided tape for the glitter borders, acetate wrap stuck down, butterfly stickers on the acetate. 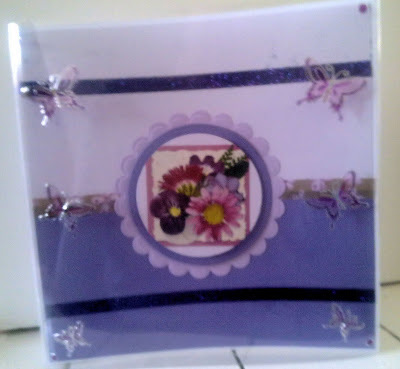 I used a kit I bought from Studio (Religious Mini O4) this has 3 pieces which fold together, the first two had circles and are in silver an the inside of the card is white. As I really didn't know how to use this type of card I drew round the circle so it that when I added the pieces on the inside of the card they could be seen through the circle in the 1st two pieces. Next I put a piece of acetate between the 1st two pieces sticking it onto the card using double sided tape, and put another strip to hold the 1st piece of card inside. I used a kit I love which I purchased from QVC, it is a Kanban kit. The aperture cards came with it and just needed the centres popping out. I then cut and stuck the acetate in the middle of the card, the toppers are decoupaged but it is hard to photograph them, I then added the gems and snowflakes. 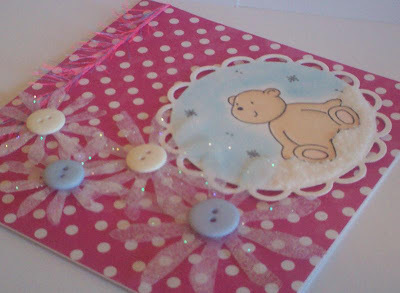 It is a easy card to make from kit form but I really love them I think they are so cute. I've used the Elzybells 'polar bear' teddy stamp, coloured with promarkers, with a chalked sky background. I used a sakura clear glitter pen on the little falling snowflakes and polar white flowersoft for snow. 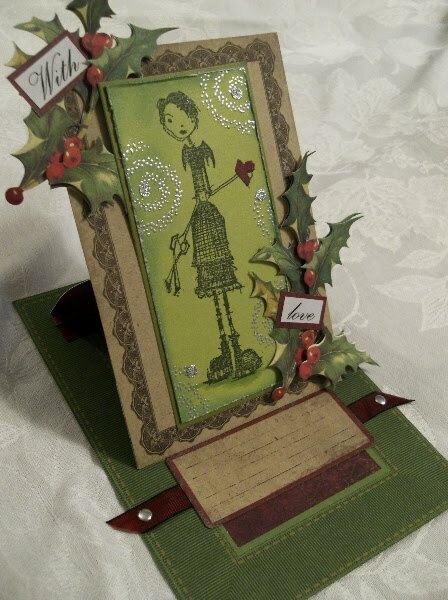 I've cut the image out with a Nellie Snellen circle die and the paper is Papermania 'naughty & nice Christmas'. I've used a Sizzix Bigz die to cut some acetate flowers (mainly because I couldn't get my snowflake die to cut through the acetate! ), then added lots of glamour dust and some buttons, and finished off with a strip of pink & blue fibres. I trimmed a card blank down leaving a 2cm strip at the front. I used a Fiskars punch to make a decorative edge. I ran a piece of acetate through a snowflake Cuttlebug embossing folder and used double sided tape stuck it to the inside of the overlapped front edge. The paper on the inside of the card is a piece of wrapping paper from Paperchase. They do some fantastic metallic and flocked designs and around £1 to £2 for a massive sheet they are very good value too. The large snowflake is a 2 step Cuttlebug die that punches and then embosses the shape. It is cut from Doodlebug flocked cardstock so feels like Fuzzy Felt :) The ribbon is a self adhesive one from Papermania, the gem is Paperchase and the sentiment is from Kanban. I created an Easel card and the butterfly is Acetate. I don't know how well it shows in the photo. I took a couple of close ups that I will put on my blog. I used the Mimi image from Pink Petticoat Designs. 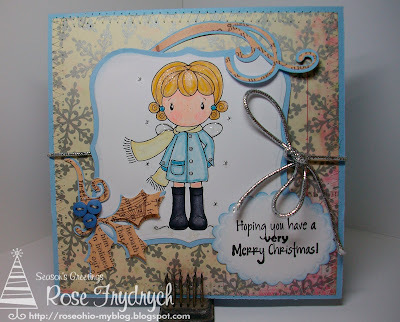 I love these Easel cards, really fun to make! 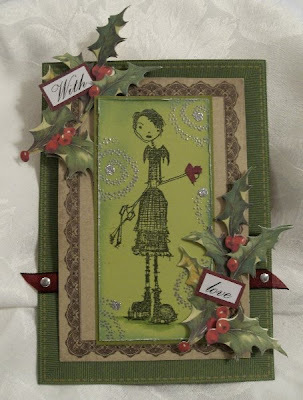 I stamped a Cute companion stamp from Christmas Magic set, the using black Memento Ink. Which I coloured in using watercolour pencils and add a chalk background to the bauble. Then I stamped the same image using stazon on to acetate. Then added stickles to the snowflakes. I cut out a frame using a scalloped nestabilitiy die. I glued the acetate bauble to this frame. I then matched up the coloured bauble up with the acetate bauble, then mounted it on to a red card. 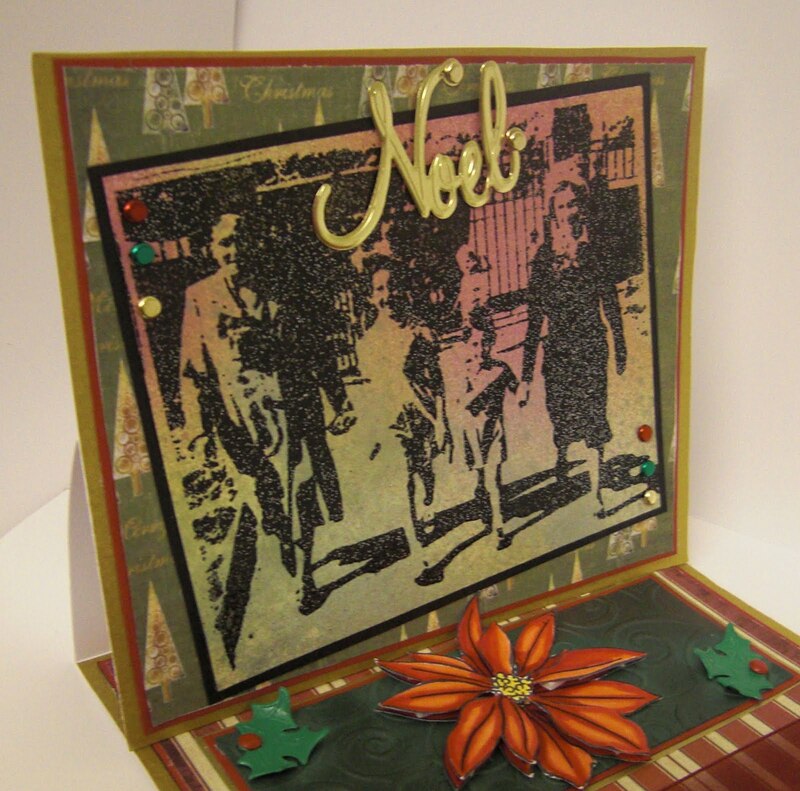 For this challenge I have created my very first Easel card whoop whoop! They are soooo simple once you make the base you realise is that IT! I shall put destructions on my blog if you don't know how to make them. The papers I used are from Bearly Mine designer extreme volume III and I stamped Tracey's Butterfly from the Butterfly Beauties plate onto acetate, flipped it over and added some glamour dust to the back using a clear glue. I used the wing of the smaller butterfly to create the corners and also glamour dusted them. This was secured onto the backing papers with brads. 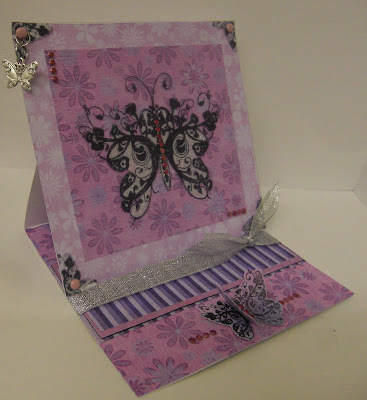 The butterfly at the bottom was made by swiping a tri colour brilliance inkpad onto card and stamping and cutting out two butterflies, making the top one 3d. Now its my absolute pleasure to introduce you to one of my oldest crafting friends (not that she's old, I've known her a long time is what I mean lol!) Cath used to run a superb shop called Katy's Corner and has appeared regularly in Craft Stamper magazine with some fabulous projects. Her blog is full of tutorials and tips so go and take a peek as its jam packed with ideas! 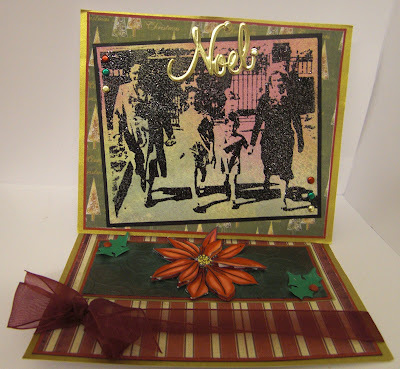 Cath has created a card using a "Caught in Crystal" method which involves floor cleaner, tissue and reinkers and anything else you'd like to chuck on too! I actually own this card, its miiiine all mine mwhahahaha! I shall put the technique up on here as soon as I can! OOOh check this out by Janine Q who is in the process of starting her blog! I think she's going to do very well around blogland! 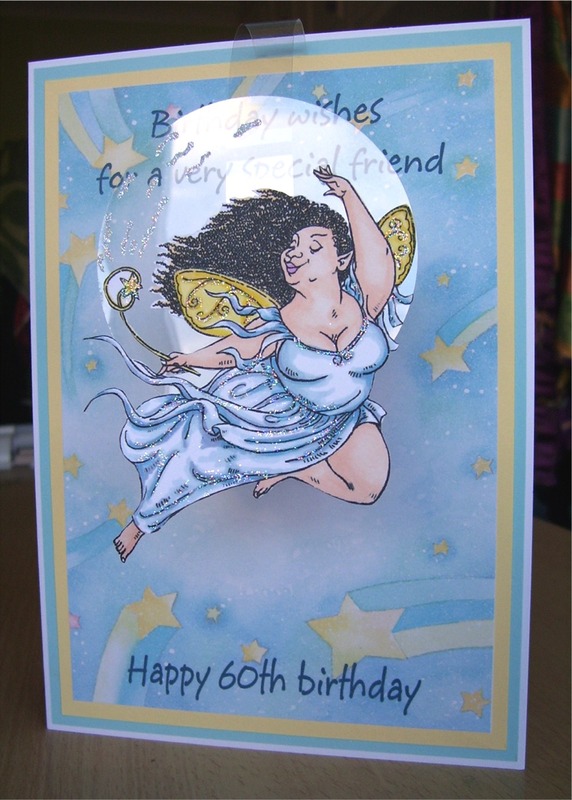 Fab little delicate acetate card by Helen C, well done! Firstly a huge THANK YOU for all your beautiful Autumn entries, so many different styles to see and we've really enjoyed browsing round them all. Such beautiful works, I love autumn colours! 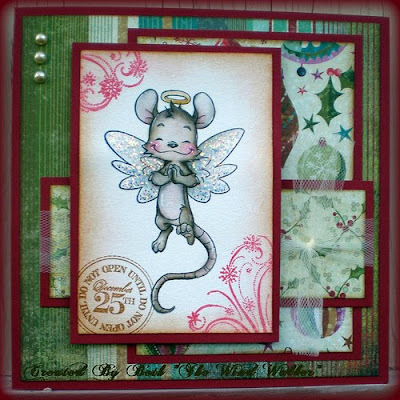 Thanks again also to Kimmi for being our guest designer for challenge 6 too. We had 35 entries for Challenge 6 - Autumn so without further ado here is the winner of the La Pashe prize. Please email me your address and I shall get these into the post for you, well done! Well Done Ladies, please feel free to grab your TOP 3 blinkie from the sidebar! Before we move onto our next challenge a quick word about our sponsor for this challenge which is again the delightful Joanna Sheen who is offering a £10 gift voucher for her online store. New products include several new sets of promarkers with the latest colours (yum!) and Joanna Sheen favourite garden flowers including a poinsettia just in time for christmas cardmaking, go take a peek to see what other goodies she has! Well this one should be pretty easy for most of you! The challenge is to include STAMPING somewhere on your design be it rubber or digital. As its sooooo easy we're throwing in an OPTIONAL extra challenge to do a stamping technique you havent done in a while or tried before. Remember anything stamped either inky or digi is fine, the optional extra is just to challenge yourself! 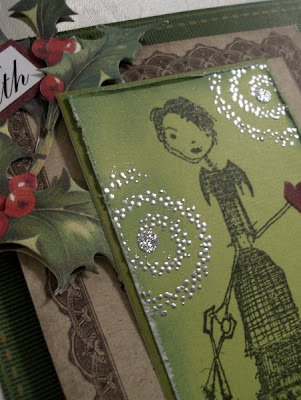 Why not try adding some stamped swirls around your image or a sentiment, drag out your heat gun and do some heat embossing, paper piecing or perhaps some resist, the choices are endless. Please post your entries into the comments box below Beth's design. Email entries are fine and you can enter our challenges up to a maximum of 3 entries on separate posts. The challenge will close at 12 noon GMT on Monday 16th November. Lets see what the Design Team have created for you! I had some oval aperture cards that I thought I'd use. 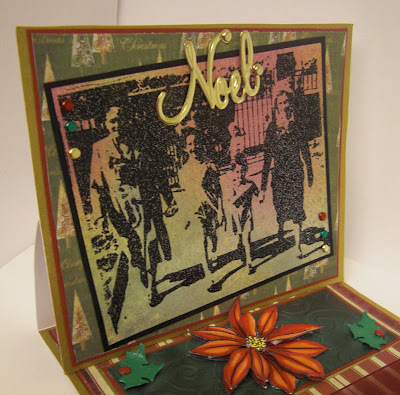 I stamped on the front with a Montage Set of snowflakes (from Stamps Away) in various blue ColorBox Chalk Inks. 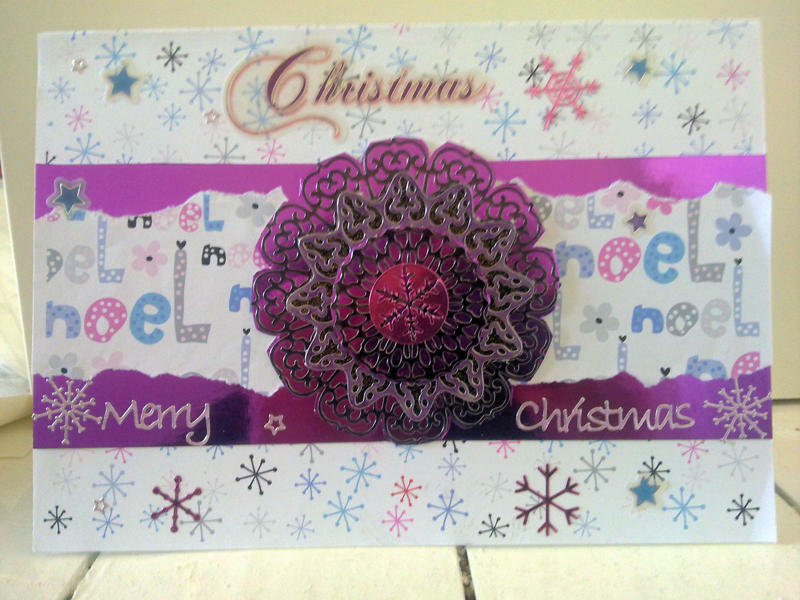 I then stamped the Father Christmas (Papermania stamp) in VersaMark and embossed with detailed silver embossing powder on the inner piece of card, sponged some chalk ink for a background and stuck the inner card in place. To finish off the card I used a border peel-off round the aperture. I used a Snowman Family Stamp and coloured it using watercolour pencils, having cut it to size I stuck it onto the blue paper towards the top of the card & finally adding an oval Friends Forever sentiment under the picture. Although this is the first time I have made any cards using a large stamp I was quite pleased with the results although I did make two mistakes, the first one was that I used ink sticks instead of a pad & the second was that I didn't let it dry properly before colouring it but we all learn along the way! Our Challenge is to stamp something, well ...................... I have used a Sarah Kay image and coloured her in with my soft strokes pens. I have used Pinks and chocolates, the backing papers are from My Minds Eye wild asparagus and Papermania exquisite collections. I stamped out some flowers in three different sizes and inked the edges. Thank you all for looking! 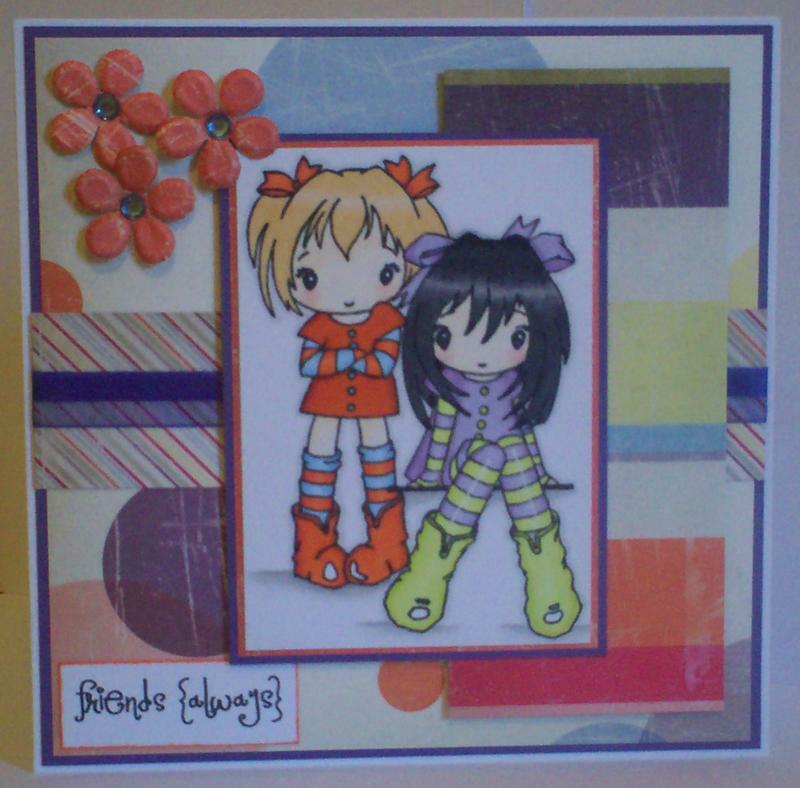 I've used Sugar Nellie Manga images - stamped the sitting girl image, then masked off and stamped the standing image behind, and coloured them with promarkers. The papers are Cosmo Cricket with Bazzill cardstock. I've added a purple ribbon, flowers cut with a x-cut punch from the reverse of one of the papers and little blue gems for flower centres, and a downloaded sentiment from Pink Petticoat. 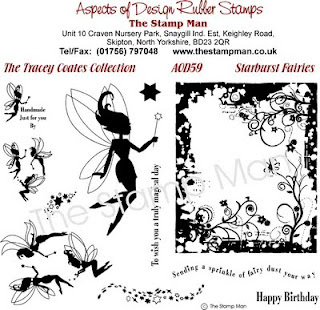 I am not the world's best rubber stamper, I love the designs and fact you can make some fabulous cards using them but would not describe myself as a 'stamper'. There are so many techniques you can use with your rubber stamps and there are so many extremely talented people who do so and could not even begin to put myself in the same category. One of my favourite ranges of rubber stamps is the Forever Friends Bears. I just love their cute little faces. I have made an easel card which I think could be my new favourite design. It looks really amazing but is so easy to do. In a row of cards on a shelf it would easily stand out from the others. You can see from the side view how the front of the card is propped up behind the heart so it 'displays' the card. Full instructions of how to make one are on my blog if you are interested. The rubber stamp image has been coloured in using watercolour pencils with a small amount of metallic gold pen for accents on the image. Materials used are Rubber stamp and heart brad - Papermania, Paper & White flower - HOTP, Red flower - Prima, Die cut hearts and glasses - Let's Make Cards, ribbon from my stash. 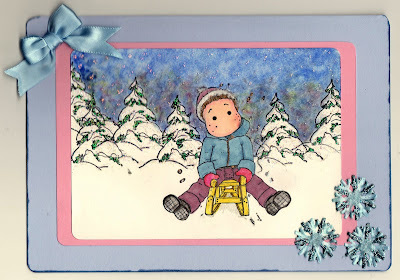 I used the new CC Designs Winter Stamp Kit for this card. I think she is Sugarplum Emma. I used sewing, paper piecing and glittering for my techniques. I've used a number of techniques for this card and a fuller writeup will be available over at my personal blog The stamp is the beautiful Butterfly Beauties stamp plate by Tracy Coates and first I coloured the face with promarkers and used this fantastic versamark pen I didn't know existed until a couple of months ago! I used it over the face then added clear embossing powder (twice to make sure it seals!) This acts as a resist for the next technique. I then used a brayer over the hair, let that dry then used the versamark pen on the hair and added kaleidoscope embossing powder which changes colour the more you heat it. I cut out the image, obviously the swirls and leaves are too small to cut so I made the background with starburst stains and radiant rain and stamped the image out again and embossed then added the cut out on top. The flower swirl was then stamped below the image and in the corners and embossed and I filled in the flowers with stickles glitter glue and added some sticky gems as interest. Now let me have the pleasure of introducing you to our next wonderful guest, Beth from Wind Walker Altered Arts. "I have only been in paper crafting for 2 years and started out with scrapbooking, moved to making ATCs and then into cards and discovered they are my favorite paper crafting project. I have been a GD for The Next Level, Tilda and Friends ATC challenge and was invited to join the Cuttle Bug DT back in August, but missed my chance because I forgot to check my gmail account. UGGGGHH!!! I currently work for The Lone Star Scrapbook Company in The Woodlands, TX and also currently a paper craft instructor there too. In mid Decmeber I will be a certified copics instructor and I am currently finishing up my certification for the Silhouette digital craft cutter from Quickutz. I will also have a few surprises up my sleeves for stampers coming up in 2010"
We'll look forward to seeing all of Beth's surprises in the New Year! 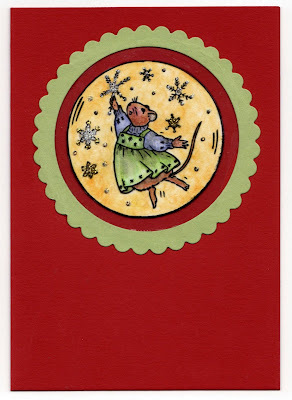 In the meantime Beth has made a beautiful design using a Whiff of Joy Henry Mouse stamp coloured with distress inks, thank you Beth!